Easy White Chocolate Raspberry Cheesecake! Rich, moist, flavorful white chocolate cheesecake is swirled with fresh or frozen raspberries. The cheesecake, baked in a premade graham cracker cookie shell, is drizzled with white chocolate. This is one of the easiest decadent desserts you can make. Every time I make this cheesecake, my son and husband finish it within a day. My husband and I married in April of 2000–a few months before we moved to Maine, switched careers, had a baby (who is now in a size ten shoe) and bought a house. We had our ceremony/mass at The Old Cathedral in St. Louis, our hometown. The reception was at the Spink Pavilion at Missouri Botanical Gardens. Several tiers of white chocolate raspberry cheesecake made by the famed Hank’s Cheesecakes in St. Louis, MO. served as our wedding cake. People are still talking today about how good the wedding food and the cake were. Hank’s Cheesecakes are time-consuming elaborate affairs of pastry. This cheesecake recipe I’m sharing with you is about as close as you can get to that experience in a short amount of time with minimal ingredients. This recipe is inspired from Eagle Brand’s recipe. This is a simple one bowl recipe. You blend together an egg, a can of sweetened condensed milk–Not Evaporated Milk–an 8-ounce brick of cream cheese, lemon juice and vanilla extract. Pour the mix into a graham cracker pie-shell then swirl in a cup of berries. While the cheesecake is baking, make a white chocolate drizzle. In a microwave-safe small bowl, melt 1/3 of a cup of white chocolate chips or disks. Do this in 20 to 30 second bursts stirring well after each time. Be sure not to overcook. White chocolate burns easily. When the white chocolate is all melty, add 1/4 cup of whipping cream and stir until well-combined. Pour into a pastry bag or a Ziploc to drizzle over the cheesecake once it has cooled. I use raspberries but you could certainly switch those out for a cup of strawberries or a cup of blueberries. I really like using whole raspberries but you can also use 1/4 cup of raspberry jam or preserves. You’ll swirl the jam into the cheesecake before it goes into the oven. White Chocolate Raspberry Cheesecake requires nine ingredients, most of which I’m sure you have in the pantry. If you need to bring a dessert to someone’s house, this is a good choice because it travels well. It’s not fragile or tall. In a large mixing bowl, beat softened cream cheese, sweetened condensed milk and egg until creamy and smooth. Add vanilla and lemon juice, beat until combined. 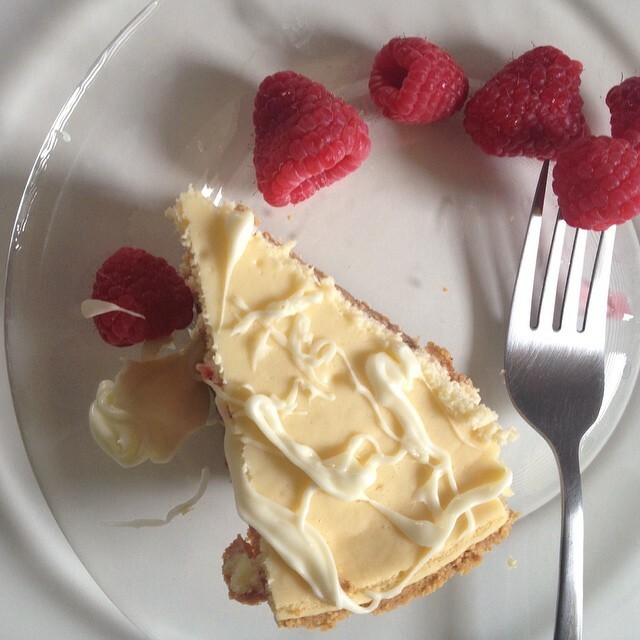 Pour cheesecake mixture over raspberries in pie crust. Bake at 350 F for 25 to 35 minutes. Cool cheesecake on counter until room temperature then slide into refrigerator to chill for several hours before serving. Just before serving: melt white chocolate chips or baking chocolate in microwave in ten second increments, stirring well, taking care not to burn the white chocolate, which scorches easily. If chocolate seems difficult to work with after melting, add a couple drops of vegetable oil (1/8 of a teaspoon) to the white chocolate and stir thoroughly. The oil will make the white chocolate easier to drizzle over the cheesecake. Slice and serve with a few raspberries for garnish. What’s your favorite flavor of cheesecake? If you make this, let me know! This dessert will make you feel like an experienced pastry chef instead of the occasional dessert baker you might actually be. 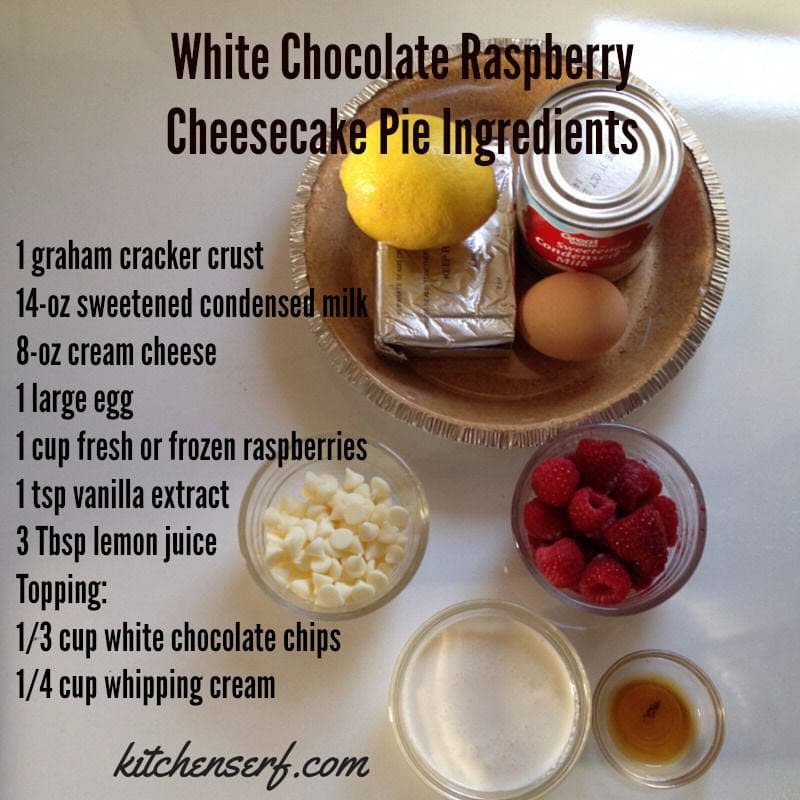 White Chocolate Raspberry Cheesecake recipe is easy. 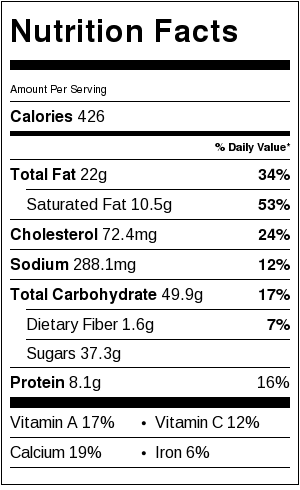 Even better, this cheesecake tastes amazing.